I usually don’t like writing reviews of consecutive books in a series, because I feel like I just end up saying the same thing over and over in each review (especially if I like the books) but I’m going to try for the Throne of Glass books, because I really like this series so far – for a lot of reasons. While I will avoid spoilers for Crown of Midnight in this review, it would be almost impossible to write a review without spoiling events of Throne of Glass, so if you haven’t read that yet you should probably stop now. Instead you can check out my review for that book, then go read it, and come back here when you’re done. 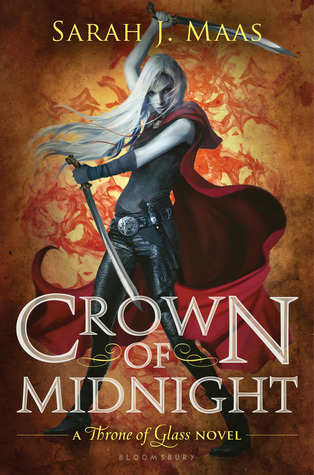 Crown of Midnight starts out a couple months after the events in Throne of Glass. Celaena is now the King’s Champion, following his order and assassinating anyone he deems a threat to his throne – or, that’s what she wants him to think she’s doing. When the King asks her to kill someone she knew in her old life as an assassin, Celaena buys time and comes up with a plan of her own. I know I mentioned this in my review of Throne of Glass, but one of my favorite aspects of this series is how wonderfully Celaena is written. She’s a girl, and she loves girly things – candy, pretty dresses, etc. – but she’s also tough as nails and 100% capable of taking care of herself without any help from anyone else. There’s almost a gender reversal going on in Crown of Midnight in some of the ways she interacts with her friends, in how she protects them and how she plans Chaol’s birthday. The biggest reversal – and something I really appreciated – was in the character of Archer, the courtesan she was instructed to kill and an acquaintance from when she was younger. The female prostitute character is so common across so many genres of books, TV and movies that it was nice seeing a male character in that role for a change. Another thing I love about this series is how Maas leaves breadcrumbs for her twists. I hate a predictable twist – when you can see something coming a mile away even without a single hint or clue. But I really appreciate when an author starts setting up a twist in the very first book though you don’t actual get said twist until later in the series. Yes, I saw it coming, but not in an annoyingly predictable way. There was enough evidence from very early in Throne of Glass that it wasn’t really a surprise for anyone but Chaol, but it was written well enough that I didn’t roll my eyes when it was revealed. Well done. There were a couple other surprises in this book that I did not see coming. One was utterly heartbreaking, and I really applaud Maas for that writing as well. What happens in the middle of the book is something that I never would have guessed or seen coming until it happened, and even then it was shocking and I was looking for a loophole until the very end. It’s a catalyst for the second half of this book and much of Heir of Fire as well (which I am a little more than halfway through at the moment). The other big development was an interesting twist for a character that will have further repercussions through the rest of the series, I’m sure. I really love that this series feels completely original and does not follow the typical YA fantasy formula. I enjoy being surprised by little things that I never would have expected, or revelations about characters that I don’t see coming. Everything about it seems fresh, and I like that. I also love the way Maas is only slowly revealing the more magical elements of the series. She continues to build the world as the series progresses; she’s constantly revealing new information about not only the world the story takes place in, but about the characters themselves, which helps keep the story new and interesting instead of feeling like it’s stagnating. And her characters keep growing. By the end of this novel they’ve changed so much from the characters we were introduced to in the first novel and I’m sure they will continue to grow and change as the series progresses. Crown of Midnight was a terrific follow-up to Throne of Glass and I’m really excited about what Maas has in store for the rest of the series.